Are you looking for a vehicle that you can plug in and charge up and that will help you get from place to place in an efficient way. 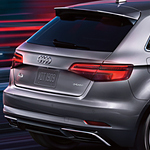 The compact plug-in hybrid that is the A3 Sportback e-tron from Audi will impress you with the way that it performs. There are different conditions that you will find yourself in as a driver and you want your vehicle to be set up well to handle those conditions. The Audi A3 Sportback e-tron offers different drive modes that you can choose from that fit with who you are as a driver and the kind of conditions that you are facing. There is an available battery hold mode with the Audi A3 Sportback e-tron that allows you to save the EV power of your vehicle for later. You can put this mode to use when you feel that it is the smart thing to do.